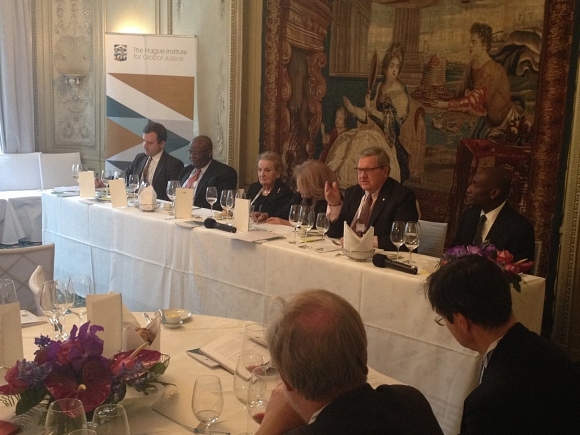 In a side event at the Munich Security Conference on 6 February, Dr. Madeleine Albright, former U.S. Secretary of State, Professor Ibrahim A. Gambari, former Foreign Minister of Nigeria and Lloyd Axworthy, former Minister of Foreign Affairs of Canada joined Hague Institute staff and selected experts to discuss the future of security governance, peacebuilding and the responsibility to protect (R2P). Titled “Fragile States and the Fault-Lines of Global Security and Justice”, the consultation was part of a larger series of events dedicated to The Commission on Global Security, Justice & Governance which is releasing a set of policy and institutional recommendations ahead of the United Nations’ 70th Anniversary Summit. In his opening address, Dr. Abiodun Williams, President of The Hague Institute, outlined the recommendations of The Commission, expected in June 2015, as “forward-leaning and politically grounded” with a view to providing a road-map with desirable and feasible improvements for global policy and the architecture of global governance as a whole. The Commission’s Co-chair, Professor Gambari, focused on the importance of coordinated joint efforts between the United Nations and other actors such as the African Union in dealing with security and justice issues in Africa. He also identified corruption and youth unemployment as threats to human security and justice that the Commission has to take into account. Intervention in Ukraine, a theme which emerged throughout the first day of the Munich Security conference, also came up in the Commission’s side event. Dr. Albright drew attention to the historical importance of developments in Ukraine. She also emphasized the importance of translating phenomena such as Tahrir Square in Egypt into functioning governance, enhancing the prospects and opportunities for the next generation. “Ten million babies have been born in Egypt since Tahrir Square. What will their future look like?” asked the former Secretary of State. Reflection of these crucial issues continues. As the side event at the Munich Security Conference concluded, an e-consultation was launched as part of the Commission’s consultative process, using key points and insights from Munich as points of departure for further expert discussions on fragile and conflict-affected environments around the world. The Commission’s activities could be followed on its website www.globalsecurityjusticegovernance.org as well as on Twitter using the handle @BetterGlobalGov. The relevant hashtag is #SecJustGov.